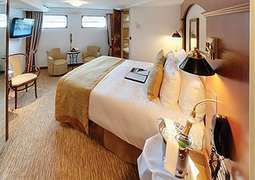 Designed with an open, airy plan that makes great use of natural light – and having just emerged from an extensive refurbishment in 2013 – ms Swiss Emerald is the perfect riverboat to cruise France's Rhône and Saône rivers. Swiss Emerald can accommodate guests in a spacious, club-like atmosphere. 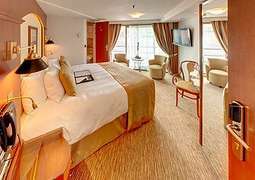 85% of staterooms feature ocean views and French balconies, and the ship boasts 14 suites measuring 27 square meters each – the most of any river cruise ship in Europe, including full marble baths. Onboard entertainment includes enrichment lectures, piano music nightly, in-room movies, culinary demos, local entertainment and “themed” fun. Fitness center and exotic massages are available. Enjoy the putting green or the jacuzzi on the Sun Deck. All available 24 hours.